Horsemanship development lessons are a time for you and your horse to puzzle-solve and deal with challenges in the moment with the attention of a licensed Parelli professional instructor. The lessons will incorporate theory, simulations and playing with your horse on the ground with a lead line and halter (On Line Savvy). I am qualified to instruct you from the very beginning of Parelli up through the progressive education levels, as far as and including, Level 3 in the On Line Savvy. I would be honoured to be involved in your introduction, education and progression with Parelli Natural Horsemanship. Allow me to share Parelli with you. Parelli is the key to success with horses! I am especially interested in working with children/young people. See more about our lessons and clinics on the Services page. Maureen is patient, fun and very caring. She always finds the good things in people and their ponies. 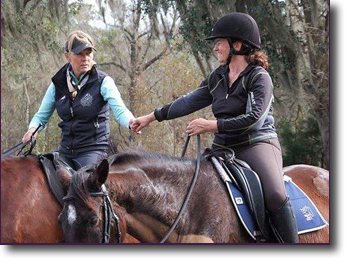 I love working with Maureen and thank her for all she has done to help me and my pony Maple go through our natural horsemanship journey with Parelli. We now have our level one and can’t wait to tape our level 2… Love always.